Plastic recycling is one of the fastest growing areas in extrusion. The ability to size reduce post industrial and post consumer plastic waste is the critical first step in re-processing. High resin prices and resin shortages are driving the demand for alternative materials. At EAS, we have experience in all the main equipment areas required to specify a complete plastics recycling facility. Size reduction by shredding and grinding, with all the machinery variables and options, is a very important area within our core technical competence. 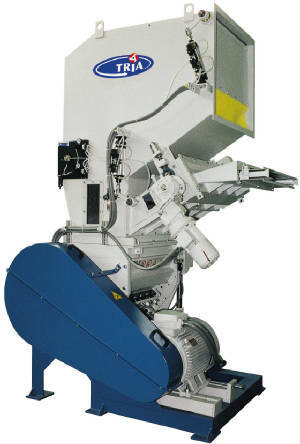 Further, fines separation systems are a big benefit in producing clean re-grind materials that are easy to handle and perform well in the recycling extruder. Whether you need assistance with a single piece of equipment, or an entire recycling plant...we can help! Recycling plastics can be profitable - whether reclaiming your own scrap, adding recycled content to your products or selling recycled materials. The size reduction part of the system sets the pace for the entire recycling process and often is a critical item requiring excessive maintenance and causing downtime. Fines separation is an important consideration when putting together any recycling line. EAS will find just the right equipment to fit your needs. 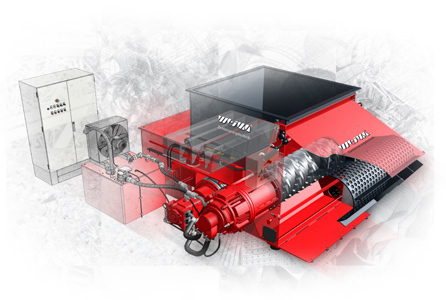 Shredders, grinders and fines separation systems. 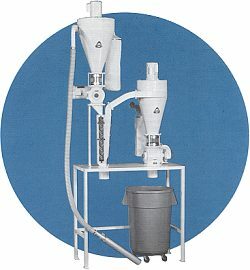 Pneumatic conveying and fines separation.